There are many applications and online tools available to convert PDF files to word files but PDF to Word Facebook edition is different. It is different in the sense that it converts PDF files right on Facebook without requiring you to install anything on your PC. 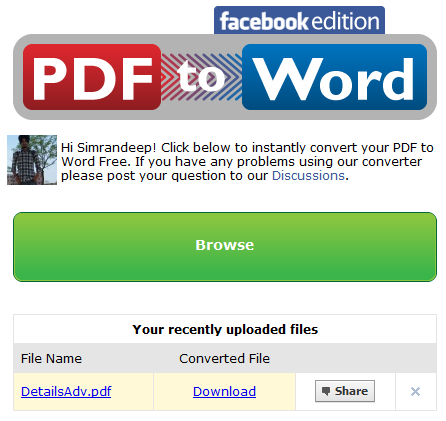 All you need is to login to your Facebook account and open PDF to Word Facebook Edition app. When you open the application click on the Browse button and upload the PDF file that you want to convert. You can also upload multiple files. Now the app will automatically convert your PDF files to word (Doc) files. It will take some time depending on the size of the file you are uploading. After successful conversion of the file, click on download link to download your converted file. There is an option to share it with your friends too. PDF to Word Facebook Edition also take care of your privacy. It allows you to delete your file anytime you like. Files are stored for 30 days after being uploaded and after 30 days files are deleted automatically. The article really added to my knowledge. It was not known to me before. Many many thanks for sharing. Awesome idea. This tool may come in handy for a lot of us, ebook writers, because byit will make the conversion much more easier and without having to install anything.